Our reflective noise screen has been successfully used on highways, railways and other areas where there is a requirement in the reduction of noise nuisance. 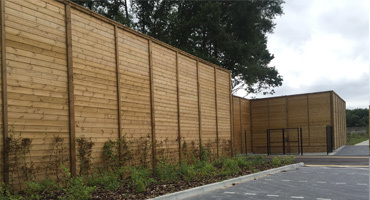 Depending on the required screen height the systems normally consists of either timber or galvanised RSJ support posts and specially constructed timber panels. 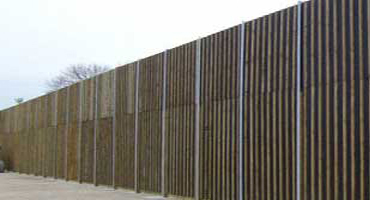 Tested and compliant to BS EN 1794-2, the acoustic reflective timber screens also comply with Highways Sector Scheme 2C for the prefabrication of environmental barriers. Design in accordance with Specification for Highway Works Clause 2504. Treatment to Sector Scheme 4. 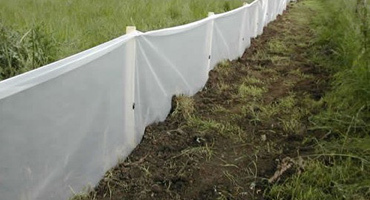 Depending on Screen Height – Screens can be fitted to timber or steel posts. Structural calculations may be required to ascertain local conditions for post and foundation design. 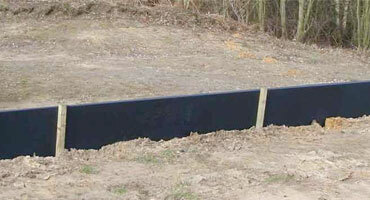 Option for double sided screen using TG& V timbers. Finish: All steel work galvanised to BS EN ISO 1461 and option to Polyester Powder Coat. All fixings galvanised only. All timber tanalised.